The Breathalyzer Shop are very pleased to offer the very latest version of the AL2500, the sleek black AL2500 Elite X Breathalyzer. This is a brand new version and is not the same model as sold on competitor websites as the AL2500 or AL2500 Elite or AL2500 Prime. 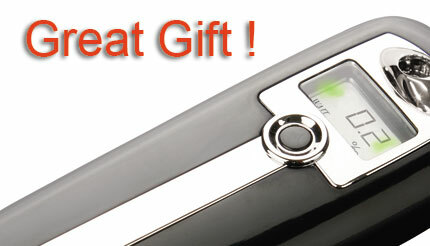 The AL2500 Elite X is supplied with 2 Free batteries, 3 reusable plastic mouthpieces. It is light and convenient - easily stored in a pocket, handbag or car glovebox. A perfect party/gift unit with the added bonus of the additional features shown below. Great Fun at social get togethers/ parties etc. This unit is not suitable as a device for use in employee testing or as the basis for further action in an employee testing environment, if you require a higher accuracy breathalyser then please consult our 'which breathalyzer' guide. 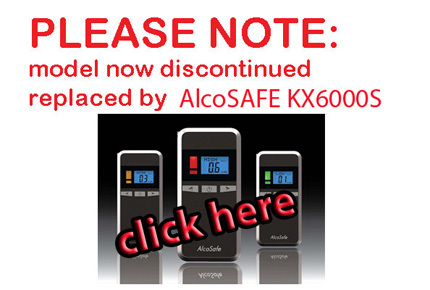 The AL2500 Elite X is a good morning after breathalyser. The Breathalyser is calibrated to the UK standard of mg/litre but is fully usable in any country.